Here you can explore our plant collection by searching for your plant of interest by its common name or scientific name. Perhaps you are interested in a special part of the garden, then you can use the map feature or search in the locations field. All plants in the garden have a unique code, accession number, to which history, information and pictures are connected. Plant knowledge, education and scientific research are the backbone of our plant collection and we have a close collaboration with the University of Gothenburg. 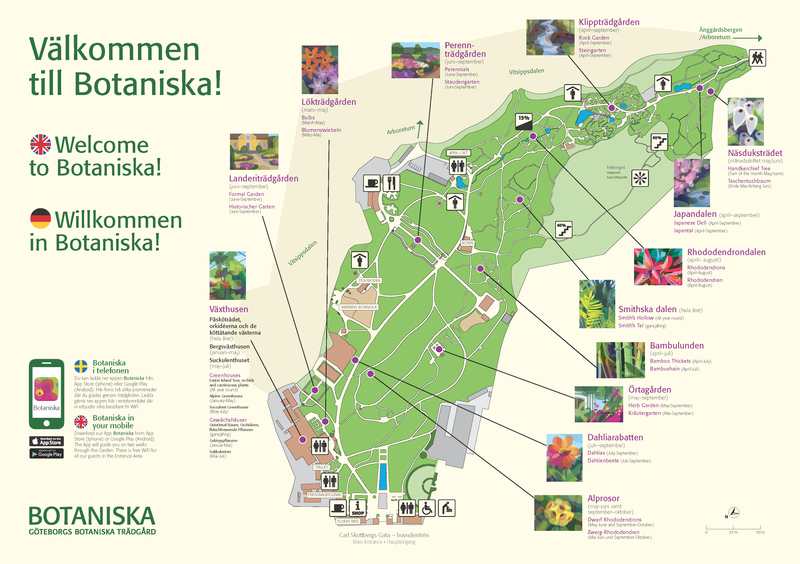 Botaniska offers a variety of horticultural expression and beauty and a unique collection of bulbs and tubers. The arboretum covers an area of 175 hectares and holds an exclusive collection of 6 000 trees. For more information about the garden please visit our website. Welcome to explore a world of biodiversity! Click on the map for a larger version or download the map.